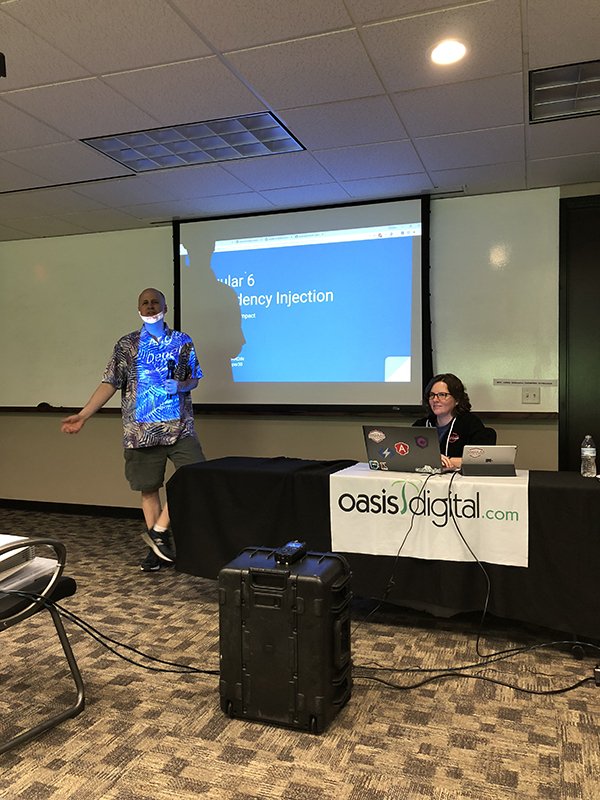 Spaghetti Tom: I saw Chris Hardin speak on Dependency Injection in Angular 6 midday Wednesday at the St. Louis Angular Lunch. I saw Chris Hardin speak on Dependency Injection in Angular 6 midday Wednesday at the St. Louis Angular Lunch. First, at the root of the tree is the root injector for the whole of the application. Injectors here are singletons and they get looped in at the outermost module. Once a service (anything injected, the items at the providers metadata property) is setup here its lifecycle will be the whole of the lifecycle of the application. The "root" way of doing things is the default way of doing things and the recommended way of doing things. Next, at the component level one may similarly have a service (at the providers metadata property) and these are available to that component and child components and have lifecycles tied to the component where they are looped in. Chris gave a rich text editor with a bunch of controls written in a parent-with-a-tree-of-children manner as a good use case for these. If the WYSIWYG editor needed to appear upon clicking in a textarea and then go away again to be refreshed anew when a different textarea is edited, then the lifecycle behavior herein is appropriate to that circumstance. Most of Chris' other experience with dependency injection is of the Java Spring framework and she said that the component level injection felt like what would be a prototype bean in that alternative universe. Alright, the important thing to know here is that when a component service has a conflict with seemingly the same service in a module that the component service wins. This is not the challenging, tricky part. Finally, services created at lazy loaded modules can "shadow" those created at root and allow you to accidentally get multiple instances of things and here is where the bad creeps in. Augury can even misreport the services from lazy loaded modules as if they are of root.